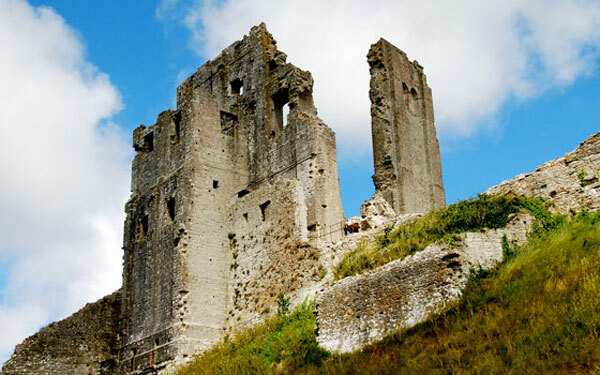 It may have been a defensive site even in Roman times and Corfe Castle certainly has had a colourful history. The first castle buildings would have been built of wood. In 979 King Edward was reputedly murdered by his step-mother so that her own son Ethelred the Unready could become King of England. In the latter half of the 11th Century the Castle was rebuilt in stone by William the Conqueror and for the next six hundred years was a royal fortress used by the monarchs of England and latterly their constables. By 1572 warfare had changed and Corfe Castle was sold by Queen Elizabeth I to Sir Christopher Hatton, her dancing master and favourite. In 1635 the Castle was bought by Sir John Bankes, who was Lord Chief Justice, as an occasional private residence. As trouble brewed for Charles I, the Bankes family took up permanent residence. By 1643 most of Dorset was occupied by the Parliamentarians, and Lady Bankes and her supporters successfully withstood a six week long siege. Sir John Bankes died in 1644 and the family endured a series of half-hearted blockades by Parliamentary forces. Late in 1645 Colonel Bingham Governor of Poole started a second siege, and treachery by one of the garrison allowed a Parliamentary force into the castle in February 1646. The Roundheads allowed the family to leave the Castle and then it was systematically destroyed by Parliamentary sappers. Sir Ralph Bankes, son of Sir John, built a new home, Kingston Lacy House, to the west of Wimborne and managed to gather together many of the plundered possessions to furnish the new house. The Castle remained in the ownership of the Bankes family until 1982 when it was bequeathed as part of the Kingston Lacy and Corfe Castle Estate to the National Trust by Mr.H J R Bankes. Last entry to the castle is 30 minutes before closing. Castle, shop and tea-rooms closed 3 March and 25 to 26 December.